I’ve just returned from the most amazing experience of my life, and almost have to pinch myself to believe that it was real. Not only am I amazed that I have won this award but all the trappings that went with it were like being a movie star for the day, and I feel truly blessed to have been part of this event. To top it all off the prize money will enable me to achieve my dream of creating a foundation to help athletes with disabilities. The ceremony was held in Sydney, and the four other finalists and I were flown down the day before and Gala afternoon presentation. Most of the details were surprise so we didn’t know what amazing journey was ahead. What awaited us was movie star treatment. Today my movie fantasy became a reality!!!! I was met by a lovely chauffeur holding a sign with my name. After a quick lesson in how to dismantle my wheelchair we headed to my hotel which is on the waterfront in Sydney Harbour! I don’t know about you but every time I watch a movie with airport arrivals scene I fantasise about being greeted by one of those men in a suit with a sign having my name on it. In my movie fantasy he then carries all my awkward baggage to the car and whisks me away to my destination without me having to wrangle my suitcase to the train or taxi rank holding a suitcase in one hand and and pushing a wheelchair with the other. ‘De’ fence : how dangerous can one blonde girl in a wheelchair be to a bunch of world leaders? It seems a certain US president ( George W Bush) is coming to town for the APEC summit, and to protect him and the other world leaders they’ve built well, a fence, in the Sydney CBD. Unfortunately for me this fence also happens to be right near the perfect shot of the Opera house and city from near my hotel. So when I set out for a morning walk to play to tourist and get a ‘selfie’ with the Sydney city, Harbour Bridge and Opera house etc in the background I promptly had some kindly police (or security maybe?) asking me not to take photos and checking my camera for photos I’d already taken. Geesh that was a close call. Really how dangerous can one blonde girl in a wheelchair be to a bunch of world leaders? The day of the awards was to be a busy one, starting with the breakfast for the finalists with staff from Cosmo and sponsor Biore. Then we were heading back to our rooms were our styling session and makeover before being picked up in a limo and whisked off to walk the red carpet! The breakfast was held in our hotel restaurant and as one of the first to arrive in the foyer I got to meet the other finalists Nandilla, Michelle and Leilani. They are lovely girls. Then the ‘Cosmo girls’ started to arrive. As an avid cosmo fan I was so nervous and excited about this moment, especially meeting the editor Sarah Wilson. For some crazy reason I had it in my head that the staff at Cosmopolitan would be ridiculously glamorous fashionistas, which left me stressing out about what to wear. I eventually settled on a black maxi dress with a red coral necklace. When we got to the breakfast the Cosmo staff were much more casually dressed than us. Sarah Wilson arrived after we were all sitting down. Having already been to the gym and been on top of some calls to the office by 7 AM she came in make up free, wearing the shortest dress I’d ever seen and complaining about the cold. No wonder you are cold I thought – you forgot to put on your pants!!! So much for all my Anna Wintour like visions she was….eek …. a normal person. 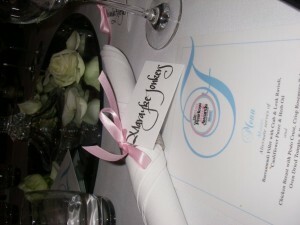 Also at the table was Anna Parle, from the sponsor Biore, the skincare range. We chatted about whether there was a difference between skincare products for men and women (we all seems to agree out the current trend-have boyfriends starting to sneakily use our skincare bottles in the bathroom!). 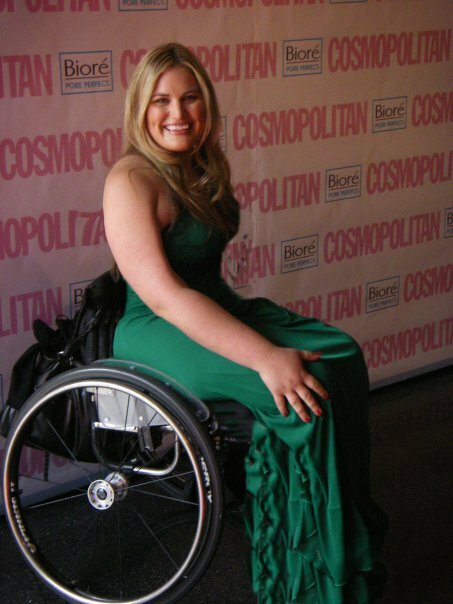 The other finalists are lovely and we’ve decided to get together in my room to get dressed, as being the disabled access room its much larger. There are the four of us, Michelle’s mum (she is under age so her lucky mum got to come along), the hair and make up artist and two stylists. Sarah Wilson will be coming to get ready with us later on! The stylists arrived with suitcases filled with everything a girl ever fantasised about wearing- earrings, necklaces and rings bracelets shoes and gowns! All of us girls gathered around and we decided who was taking turns to go for hair, make up, styling etc. After trying on some of the offerings and discovering much to my disappointment that they didn’t fit I decided to wear my own green maxi dress, styled with one of their long gold necklaces and a gold bracelet. That was the easy bit. The hard bit turned out to be finding a bra that would fit and not stick out (haven’t we all had those moments girls). Never fear the styling team were there to pin and tape said strapless bra and dress together, and even stitched the straps shorter so nothing showed. The crazy bit is all the clothes jewellery and even shoes are on loan to cosmopolitan, and have to go back to the store. So we’re wearing dresses with tags tucked in, and they even put masking tape on the bottom of the shoes so after they’ve been walked in they can remove the tape and they still look clean. The tricks of the trade! Cosmo had hired a hair and make-up artist to ‘do us up’ for the event, she has worked with lots of celebs including Jennifer Hawkins- I wondered whether she can make me look like this universe too!!! She asks my hair fantasy, and as soon as I talk about loose curls she sets to work. It looks amazing (wish I could get my hair to look like that). For make up she decides to go natural. I am amazed because she even says what I have now looks good which is crazy to me because being a swimmer I don’t wear make-up every day- I even had to look up the tutorial in Cosmo (of course) when doing my make-up for breakfast this morning. With a swish of lip gloss and rosy pink blush I am done. On my bed Nandilla is showing Sarah Wilson scrapbook of some of the girls she works with running empowerment programs in the prisons. The hair and make up artist has moved on to Michelle’s mum giving her a sweet updo, then I took a moment into the bathroom to freshen up. When I come out we are being rushed out the door to get our limos… Sarah has not even start to have her hair and make-up done, and I wonder why she doesn’t seem stressed about making it on time. Maybe the life of a Cosmo editor isn’t as glamorous as I thought…. 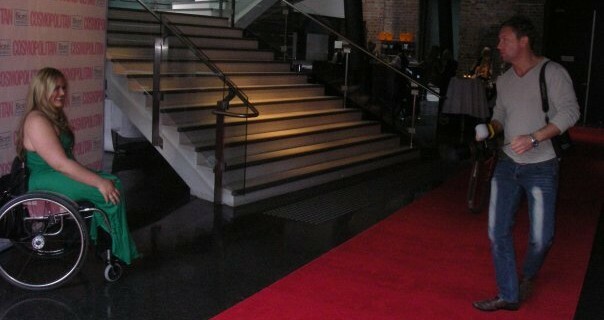 Our separate limos pull up at the front of the venue (I can’t believe they’re hired cars to drive us kilometre up the road, they didn’t want us to walk in heels and dresses) and we walk into a room filled with photographers and the red carpet. Many glamorous celebrities are taking turns to pose, and in between we giggle and rush over to take turns photographing each other. Eventually I get brave enough to approach Sophie Faulkner that ask if shall have a photo with me-wow! Sarah Wilson turns up after the quickest change in history, looking gorgeous in a short orange dress. Inside the room looks incredible. Tables are set with white tablecloths and silverware. At my seat I have diamante napkin ring my name written in calligraphy on the tag. 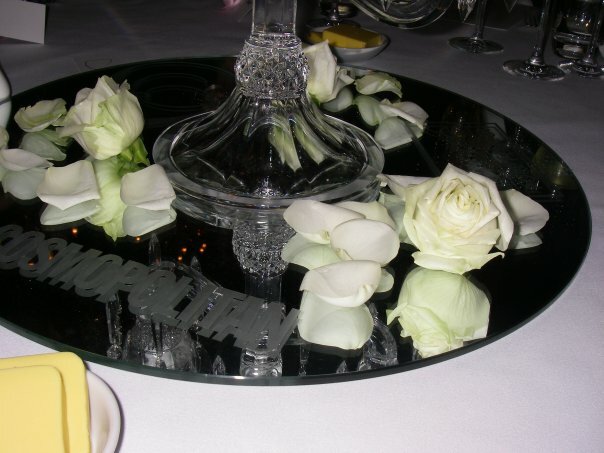 The centre of the table is filled with white flowers rested on a mirrored centrepiece that has cosmopolitans logo etched into it. The ceiling is hung with chandeliers, creating a gorgeous atmosphere which is only enhanced by the surprise entertainment…….. an interpretive dance by the Australian ballet. I am seated at the table beside radio personality Bianca Dye, with an empty chair between us. What happens next took my breath away………… My favourite singer in the whole world Delta Goodrem… Yes Delta herself…….. Comes and sits beside me. Eventually I work up the courage to say hi and tell her how much I love her music and that I listen to her CDs before I race. She is lovely and we get into a girly conversation about how she had glued her eyes with fake lashes, and how self tan doesn’t dry evenly! I’m quickly learning today that people who seem so famous and glamorous really just like the rest of us! Delta even poses for official photographs with Sarah Wilson, the other finalists and I before the announcement of the winner. Its me… I have won! I know it probably sounds completely trite and cliched to say, but by the time it came to the big announcement I already felt like I had won. The whole experience had been incredible and so far removed from my usual daily life of swimming pools and uni- being picked up by a limo, hair, make up, walking a red carpet, meeting TV greatness (like Kerry Ann Kennely and Sophie Faulkner)! What more could a girl ask for. But as the event drew to a close the announcement arrived… and oh my god I think they just said my name. I think I sat there in stupefied silence at first wondering if I imagined it (and would therefore look very silly rushing on stage) before I realised they really did say my name and I had won! Finally on stage I was presented with a gigantic cheque for $10,000 and after making a brief speech I got a standing ovation. Wow!!! Straight after the announcement I was getting swamped by household names wanting to say congratulations, definitely one of those ‘pinch me’ moments! Only wish I had a camera handy to snap a photo with KerryAnn Kennerley and Mikala Banahas and Carla Zampatti. One person I was really honoured to meet was Olympic gold medallist Kerri pottarst, she told me I was amazing at public speaking and should think about making a career out of it. Wow. Straight after the event finished it was time for my magazine photo shoot and interview. We take some photos beside a rustic brick wall. It strange trying to work out how to pose I’ve never really had to do this before, but the photographer is really helpful. Then I move on to the interview which lasts about an hour. By the time I am finished everyone has gone home. And sad I didn’t get a chance to see the other finalists and say goodbye. Out the front m my driver is waiting to take me back to the hotel, were finally get the chance to stop and think about everything that has happened today and how it will change my life. 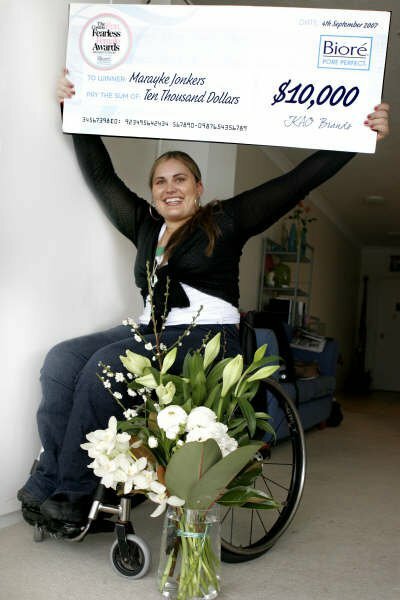 In my acceptance speech I told the room I hope to use the money to start a charity helping athletes with disabilities, so they too can achieve their sporting dreams. I spend the night alone in my room dreaming up potential charity names (live your dreams/chase your dreams/sporting dreams maybe?) while eating room service and listening to helicopters zoom around preparing for APEC. I haven’t told my family about the win…. Think it might be a nice surprise for them at the airport tomorrow when I turn up with a giant cheque and bouquet of flowers. Boy was I wrong in my fantasies about the ‘glamorous’ life Cosmo editor leads. How the hell am I going to carry this giant cheque home on the plane-hope I can check it in as a separate item of luggage!! After arriving at the awards in a limo, my trip home couldn’t be funnier. As the plane came into land in Maroochydore the pilot announced that due to the rain and where that they were unable to make the landing and would continue to Brisbane. That left my entire family standing at Sunshine Coast airport with cage full of my pet rats and my fish tank who they had been pet sitting while I was away! Of course the bus they organised to take passengers from Brisbane airport to the Sunshine Coast was not wheelchair accessible, so I was immediately engaged in some disability advocacy sorting out a driving service (to be paid follow-up by jet star) for myself and an elderly female passenger called Clarice. While waiting in the airport had the most crazy radio interview with Sea FM who happened to call, they made a call out that I was standing the airport if anyone wanted to come and get me! In the end I got a limo all the way home (I could get used to this) and corollaries turned out to the most lovely company-she even gave me $10 to start sporting dreams! And so much for not telling my family….. It’s a lead news story on ninemsn, have done dozens of radio interviews and it seems to be in every newspaper in the country -my cousin even saw me in a northern territory newspaper! What an experience!